Drone Minds is a global community of people who are enthusiastic about drones and their positive uses. The purpose of Drone Minds is to bring people together to share their videos, get advice about drones and help each other learn about all the possible good uses drones can be put to. Our members include hobbiest as well as professional aerial photographers and film makers who share their videos, photographs and help other members learn more about drones and their good uses. Can you think of any more posotive uses? If you can, please let us know! Growing a global community of civilian drone users via the Drone Minds Forums, Twitter, Youtube and Facebook where people can find out everything they want to know about drones. Extend our scope to include people with limited incomes by sponsoring them to learn about building and using drones. Build and manage a drone testing facility with accommodation where people all over the world would come to stay for days or weeks to learn about drones, test their prototypes in various environments or build specialized drones on site. Fees charged to businesses and individual visitors would be used to sponsor people on low incomes, so they could enjoy the benefits of our facility at low or zero cost. You can donate to Drone Minds by visiting our [CafePress Collections] and buying one of our clothing or mug designs etc. Just by being a member and taking the time to share your thoughts and wonderful videos you are helping us grow our community, thank you! If you have the time to suggest joining our forums to new drone pilots you meet along the way, that would be awesome too! 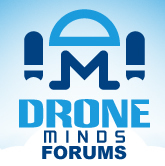 Please do let us know if you have any ideas for improving Drone Minds Forums! Jonathan is a professional drone pilot, photographer and video/film maker who runs Drone Minds in his spare time to help people learn about drones, whether they are new to the drone world, want to become drone aerial photographers or surveyors or just like using drones for fun. His interests here are helping and guiding people through his expertise with drones, aerial surveying, aerial photography and filming, which is the main focus of Drone Minds. Jonathan is a UK CAA approved professional drone pilot and photographer, and has been involved with RC Flying, robotics and photography for over 20 years, and drones specifically since 2011.